By a study of the PEW-exploratory center in Washington under the direction of the miserable ex-foreign minister Albright they would be ascertained in 44 countries that the people don't love the usamanian citizens any more. Most notably the stupid arab have an animosity against me. Egypt 70 in Jordan nearly 80 percent, in turkey 60 percent and in the industrial countries 3/4 of the people don't believe in my glory intention in Iraq! Well, I never! 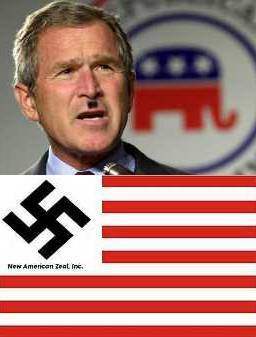 The grand leader Bush presumed a heretical falsehood by foreign propaganda-machinery to run down Usamania. If 44 countries are against us we also will even bomb them because whether they are all dead so they cannot be opposed to me! PS: I hate enemy foreigners which always besmirch my country and my ensign!